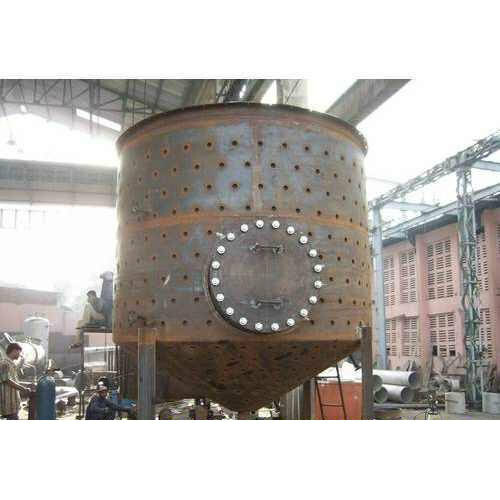 Keeping in sync with time, we are able to offer Slurry Feed Tank Reactor to our respectable clients. The offered range of slurry feed tank reactors is made utilizing high grade raw material and innovative techniques in strict compliance with the international quality norms and standards. Moreover, the offered range of slurry feed tank reactors is suitably checked on varied parameters to ensure that defect-free products are delivered at customers' premises. Ascent Machineries & Engg. Services, came into being in the year of 1996 as a manufacturer, exporter and supplier of an impeccable range of Industrial Towers, Boilers, Vessels And Storage Tanks. Along with this, we offer Reboiler, Thermic Fluid Heater, Hot Air Generator, Pressure Vessels, Storage Tanks and many more. Being quality foremost concern, we stringently follow strategically developed quality program during production process of the offered range. Product-gamut which we have come with is manufactured using high-grade basic material, that is procured from the accredited vendors of the industry. We design all our products with utmost precision incorporating advent technology keeping in mind established quality parameters of the industry. With our product range, we have been able to meet variegated demands of chemical,pharmaceutical, dairy, textile, food & beverages, brewing, dyeing & printing and hospitality industries. We have been able to bring forth the best product-range owing to endeavors of our team. This range is being conceptualized and developed under the supervision of our proficient team members. Our professionals are qualified and experienced enough to develop products addressing market demands and quality parameters. They meticulously develop products using advent technology and machinery installed at our sound production unit. Furthermore, we follow ethically formulated business policies during dealing procedures to ensure transparency. Owing to our business practice, we have been able to meet expectations of significant clients such as National Cables (Sharjah, U.A.E. ), Anchor Allied (Sharjah, U.A.E. ), Alfa Biotech (Uganda) and in all over the world.